The results of performed analyses are a base for the proper methane fermentation process control and thereby the biogas plant work efficiency. 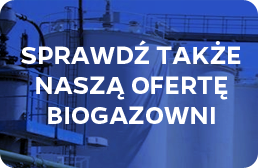 Baltic LAB Laboratory was created to optimize biogas plants work. Our services are dedicated to both starting-off and runnig biogas plants. Physico - chemical analysys of biomass that is introduce to the fermentation chamber includes measurements such as: pH, conductivity, dry mass, dry organic mass, COD etc. Examination of individual parameters allows the selection of the initial conditions of the fermentation process. Biochemical Methane Potential measurements of biomass should be performed before biogas plants is designed but also during new substrate introduction - to check time and way of the substrate storage, when substrate contamination is suspected or after biogas plant breakdown. By the results of the Biochemical Methane Potential measurements we can measure amount and composition of produced biogas, thereby the biogas plant productivity. The biogas plant condition can be estimated basing on examination of FOS and TAC parameters of fermentation biomass from each biogas plant chamber. Those measurements allow the determination of the FOS/TAC ratio, which indicates the magnitude of load (underload or overload) of methane fermentation. FOS value is the amount of all volatile fatty acids while TAC is the amount of all buffer solutions presented in the sample. The pH has a significant impact on the bacteria activity, which has to be stable to achieve effective fermentation. The buffer solutions has an impact on the pH value stability, so TAC analysis is essential. Moreover, our laboratory offers examination of the individual volatiile fatty acids which is more absorbing, however obtained results are much more valuable and precise. This analysis allows calculation of the individual acids ratio, which enables the biogas plant condition evaluation. Our services also include extended package of fermentation mass which includes: pH, conductivity, FOS, TAC, FOS/TAC, dry mass, dry organic mass and ammonium nitrogen. Analysis of the additional measurements is also very important for biogas plants work optimization. Disturbance in those parameters can tend to decrease value of produced methane and inhibit microorganisms action.